A friend of mine who runs what I consider to be the best photoblog on the web (wvs.topleftpixel.com) recently introduced me to the huey which he uses to color-calibrate his monitors. One of the first products to come out of a collaboration between PANTONE and GretagMacbeth the huey is small and compact (about the size of a Sharpie marker) and using it couldn’t be easier. Simply launch the included software which will show you exactly where to hang or attach the huey to your screen and it will then automatically run through a series of color tests. The results are then used to create a custom color profile for your system that in theory should provide far more accurate color balance and levels. The huey can then be docked into a small stand where it will monitor light levels in your room based on set time intervals and can be configured to automatically adjust your display to compensate for varying lighting conditions. Based on a couple of reviews I’ve come across the huey definitely works best with a good quality CRT or LCD display which most graphic professionals will be working with. Unfortunately though since PANTONE is positioning the huey as a consumer-level device some users with lower-end displays may get mixed results. 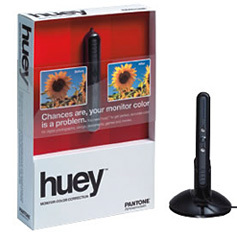 The PANTONE huey has a suggested reatail price of $89 but I’ve found it online for as low as $65 making it by far the cheapest monitor calibration system I have come across.